The Dung Beetle Project is an international outreach programme working to create a sustainable new economy powered by plastic. The Dung Beetle Project has attracted a global team of collaborators including NGOs, universities, municipalities, entrepreneurs and scientists all working towards a common goal of addressing one of our planet’s most pressing environmental issues – plastic waste. The Dung Beetle Project is working with communities around the world to divert waste plastic from landfills and the ocean and turn it into valuable energy people can use today. To make our technology more accessible to the public, we dressed it up with an art sculpture and turned it into a symbol of change. 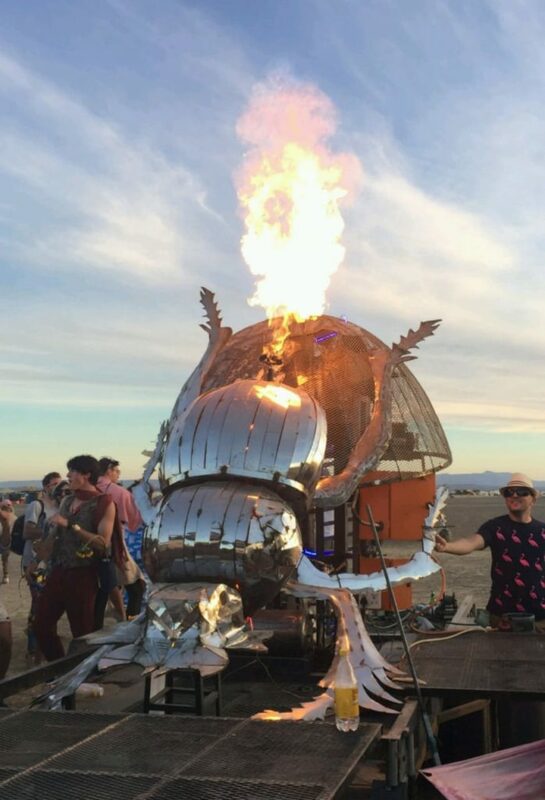 Our art is a Dung Beetle pushing the Earth, made from recycled steel. The sculpture houses a hi-tech gasification system that transforms plastic trash into electrical power and liquid fuels. A performance stage unfolds from our trailer next to the shiny 2 ½ meter-tall sculpture. The art stage is a community platform to host environmental talks, live music and science communication in association with our non-profit, Alliance Earth. The stage is a fiery center of attention for communities to come together and learn about how to create a more sustainable future together. The Dung Beetle art is a metaphor to shift the public’s attitudes toward waste. The ancient Scarab beetle was the Egyptian symbol of re-birth, bringing a new dawn by pushing the fiery Sun-god Ra up above the Nile River every day. Our Dung Beetle takes wasted fossil-fuel based plastics, which used to be ancient sunlight, and returns them into the valuable energy everyone uses today. Our fire-farting dung beetle is shifting the plastic conversation from one of despair into one of hope by turning trash into treasure. When people visit the Dung Beetle the questions start flowing: How do we get one? Does it really work? How can I help? What else is possible? 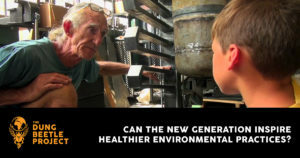 These questions get new ideas rolling, ideas that we need to secure our planet for future generations. At The Dung Beetle Project we believe in a rebirth of hope. The Dung Beetle’s mission is to inspire & facilitate that hope, fertilizing the imaginations of everyone around the world. 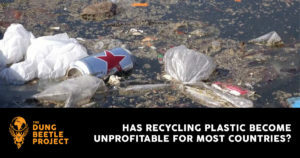 We know our bespoke technology is not the only solution to the global plastic problem so we encourage a three-pronged approach that includes continued recycling of high value plastics, a long-term goal of total plastic eradication from the consumer chain and gasification of existing trash. 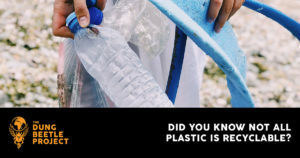 Until plastic pollution is no longer an issue, the Dung Beetle Project will continue to address this global crisis by driving forward a viable new economy powered by plastic. Join the Dung Beetle Project today, it is going to take ALL of us to beat plastic!